The pocket sewing kit originated in the middle of the 18th century. The ‘housewife’ holdall or pouch was an essential component of a soldiers equipment. It contained all that he would require to carry out repairs to his clothing when necessary. Inside, it would contain a range of items such as a thimble, needles, balls of darning wool to repair socks, darning thread to repair his uniform, spare buttons and safety pins. The kits were often a gift from a significant woman in their life: their mother, sister, wife or sweetheart. From the latter part of the 19th century and for about a hundred years thereafter the British Army issued sewing kits to soldiers as part of their official equipment. However, soldiers did not only sew to mend their clothes and maintain their equipment. Needlecraft was promoted by the Army as a worthwhile pastime to keep soldiers occupied during their hours of leisure time when confined to barracks. In postings such as Egypt, where life was often described as ‘monotonous’, engagement with crafts was perceived as a deterrent to drunkenness, unruly behaviour and the illicit attractions of Cairo. It was also promoted as an activity to assist with the recovery of injured or bedridden soldiers. There are many wonderful examples of needlecraft in regimental museums around the world which attest to the creativity and skill of soldiers. 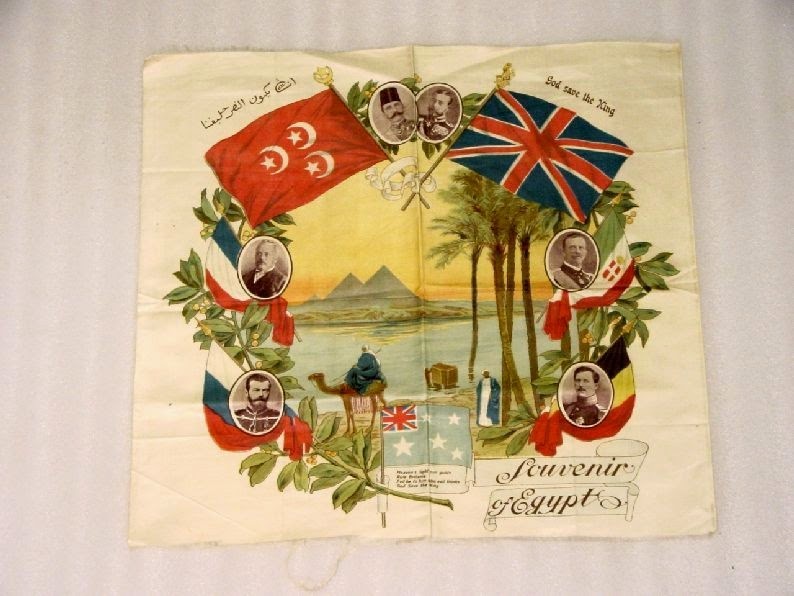 In Cairo, soldiers were able to purchase local textiles or embroidered items known collectively as a ‘Souvenir of Egypt’. These items were extremely popular during the First world War due to their colourful nature and the fact they were easy to fold and post home as gifts for loved ones. Very little is written or known about such pieces. The embroideries were machine chained stitched onto colourful cotton sateen, often sold as ‘silk’ by enterprising Egyptian salesmen, and usually bear the phrase ‘ A Souvenir of Egypt’ with a year date. Most have a distinctly Egyptian flavour and show the pyramids and sphinx, camels or date palms. Many show images associated with different armies or nations and have been fully customised by replicating unit colours as part of the overall design. 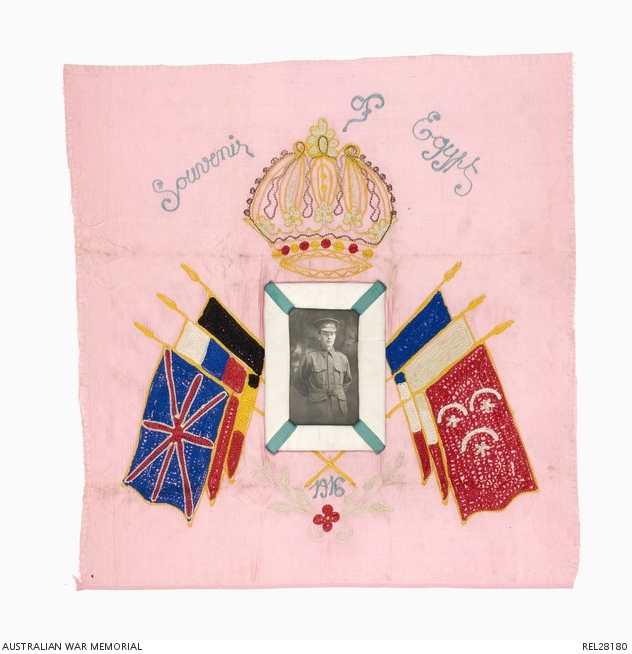 A piece of Khayamiya or Tentmaker applique, purchased in 1916 by Nurse Jane McLennan in Egypt was recently exhibited as part of the Distant Lines: Queensland Voices of the First World War exhibition. 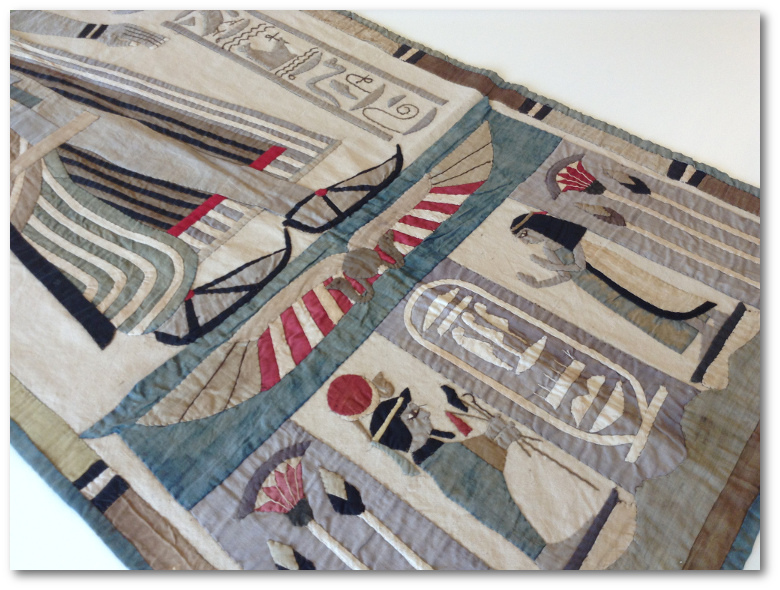 She visited Egypt en route to Salonika where her journals detail the sparseness of her tented accommodation – this item would certainly have made a welcoming decoration in such difficult circumstances. Objects collected by servicemen whilst serving during WW1 are held in many major museum collections. Pieces, such as these embroideries, function as repositories of memory and meaning, and for us today, form part of the material culture of warfare and the Commonwealth-Egyptian encounter of WW1. I look forward to exploring this area further during the course of my ongoing research.